Raising money is a necessary part of any cult or New Religious Movement and it has been especially important in Prem Rawat's organisations because of the opulent lifestyle he has demanded since arriving in the West. Donations were and are encouraged from converts by the use of "spiritual blackmail." Guru Maharaj Ji was the Lord of the Universe so he should live in opulent splendour according to his senior premies. The young Rawat humbly acquiesced to their demands. 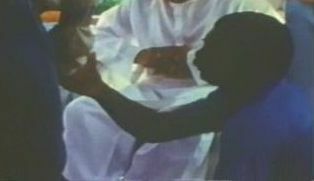 In the 2½ years 1971-73 Divine Light Mission was making all efforts to attract new devotees to prevent a looming apocalypse and create a Millenium of Peace on Earth. Once Divine Light Mission was operating successfully the young Rawat took over half the cash flow for his personal use. By 1973 Rawat was receiving $60,000 per month. In the early days in England wealthy followers were even encouraged to accompany Rawat to Harrods to purchase whatever took his fancy. The evidence of Michael Garson, a former premie who worked in the Denver headquarters during the "Darby McLean case" revealed that a major method of financing DLM was peer pressure exerted on those young recruits with inheritances. a movie camera worth $12,000 and numerous related sound devices. DLM's property holdings do not yet rival those of the Catholic Church, but they are numerous and growing. several hundred acres of property in New York, Rhode Island, Vermont and Maine, donated by premies and their friends. Michael Bergman was the executive accountant for the Divine Light Mission in 1973. He allowed Ken Kelley, a journalist for Ramparts magazine, to inspect the organization's books and interview donors. Most of the donations came from inheritances. In 1972 five premies together gave over $110,000, in early 1973 another three had given $60,000 and DLM was expecting another $200,000 each from 2 premies by July. Scores of new converts had donated gifts of $1,000 to $10,000 and the largest contribution had been $40,000. Sophia Collier also mentions a $350,000 inheritance donated to the Mission in 1974 that allowed (among other things) magazine publication to restart. Ted Patrick, the (in)famous "de-programmer," wrote in his book Let Our Children Go that donations of $50,000 were not uncommon and one woman he was deprogramming had signed over an inheritance of half a million dollars to the cult. Jos Lammers, who in 1976 was an administrator in DLM IHQ (International Headquarters in Denver) related how he saw Rawat touring European Jewellery stores being followed by local premies who were there to pay for his purchases. Rennie Davis explained that the Mission's success depended wholly on the "incidence of coincidence" and that the fortuitous donations that arrived when necessary could only be construed as proof of divine grace. Jeanne Messer wrote in an article in The New Religious Consciousness that the Mission managed to stay solvent because the number of supporting members increased so rapidly but that this could continue only so long as it expanded. This expansion slowed or ceased in 1974 leaving Bob Mishler and Rick Berman to explain at Guru Puja '74 in Amherst that unless the other 12,000 active members of DLM at that festival began to make regular donations of 10% of their income the 800 ashram premies currently keeping it afloat would go crazy. This message was also the theme of the Divine Times of July 1974. However in an interview in the January 1976 issue of Divine Times magazine Michael Dettmers, then vice-president of Divine Light Mission, explained that only some extremely large donations from a handful of premies had made up the $500,000 shortfall in DLM's 1975 finances. DLM administrators attempted to increase funding through requesting all premies begin tithing, the Active Membership Program or AMP. On March 31, 1975 a letter of thanks was sent to DLM contibutors. It contained a very upbeat review of the Mission's activities in 1974 and Rawat's Proclamation For 1975. He told a meeting of DLM directors that premies "are spiritually ready and that they can communicate the message of Knowledge more effectively." He prophesised that 1975 will be a year of propagation. He also demanded strong local communities which can serve as propagational centers in each region; a sound financial base within the Mission and satsang, service and meditation for every individual premie while feeding the world through DUO, WWA and Project Love. In November 1973, 15 to 20,000 premies attended Millenium '73 festival in Houston, Texas. Only 2,500 premies were part of the Active Memebership Program. None of Maharaji's plans for 1975 eventuated and by the end of 1975 there were only 572 ashram residents left in 24 cities but 1975 was a raging success compared to 1976.